SCL has developed an Avian Protection Program (APP) to protect and conserve migratory birds by reducing the risks that result from avian contact with utility facilities. The measures incorporated into the APP are based on guidelines developed collaboratively between the electrical utility industry and the U.S. Fish and Wildlife Service to enable utilities to improve reliability while being responsible stewards to the environment. 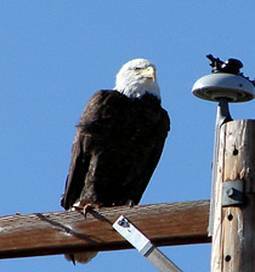 Guidelines for avian protection are described in documents prepared by the Avian Power Line Interaction Committee (APLIC) and the USFWS. All native migratory bird species are protected in the SCL service territory and near its generation and transmission facilities. The Migratory Bird Treaty Act (MBTA) and the Endangered Species Act (ESA) prohibits the killing of these species of birds. Bald eagles are also protected under the Bald and Golden Eagle Protection Act. Not only are bird deaths from electrocution on above-ground power distribution systems and collision with distribution and transmission lines considered "Take" under the MTBA but the events also result in unplanned disruption of electrical service and increase the cost of providing power to SCL customers. Through the efforts of SCL in adding avian protection measures, the number of known avian deaths has declined from a high of 602 in 1988 to 204 in 2008. Crows account for about 92 percent of these events.